from 69-70 had 35mm Delorto Carb. Dry Clutch, Bendix Scintilla Magneto and was available with a 4 or 5 speed gearbox. 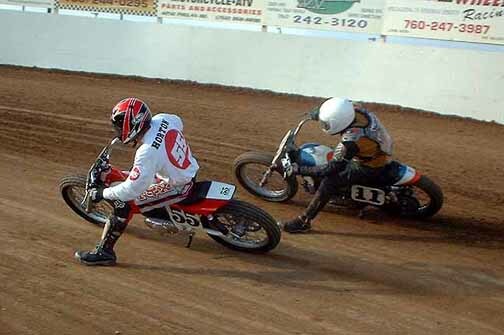 Road Racing; however a long rod motor might work better on an indoor short course. extremely radical camshafts in the OEM CR motors. 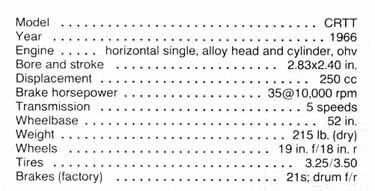 Races in the late 70'S & 80'S that were won by ROTAXS have HD in the MFG Column. 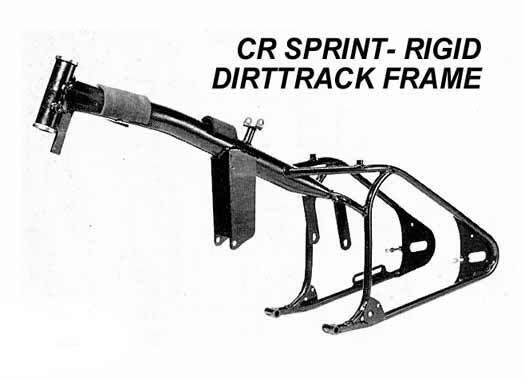 CRTT is essentially the RRer Model which has Rear Suspension (shocks) Brakes, etc. Trackmaster, rode a ton of indoor races at San Jose, Cow Palace and Santa Rosa...sold it for $300 in early '70's....damn. 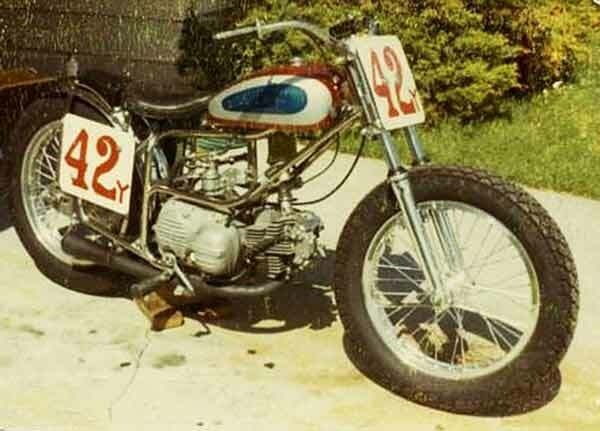 Rod Lake's #25 Cal Rayborn Replica CR utilizing a Sonicweld/Trackmaster Chromemoly Frame. have the large hump of the Bendix Scintilla Magneto and vent cover of the Dry Clutch. 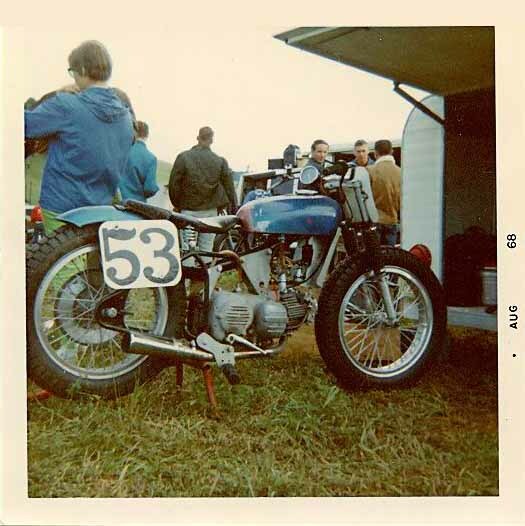 An old 87 Mark Brelsford CR. 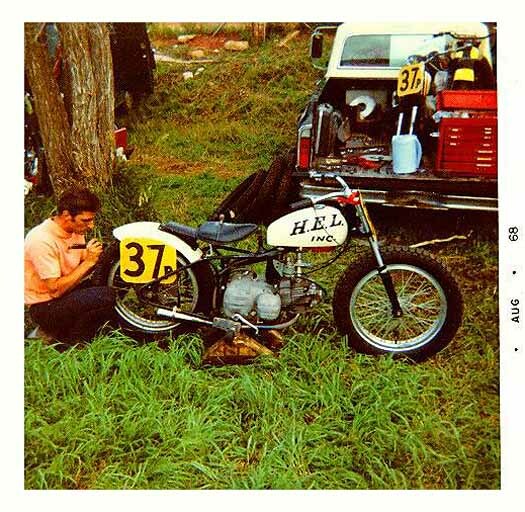 This bike had a Jim Belland Built Frame but still used the Aermacchi short rod Engine. 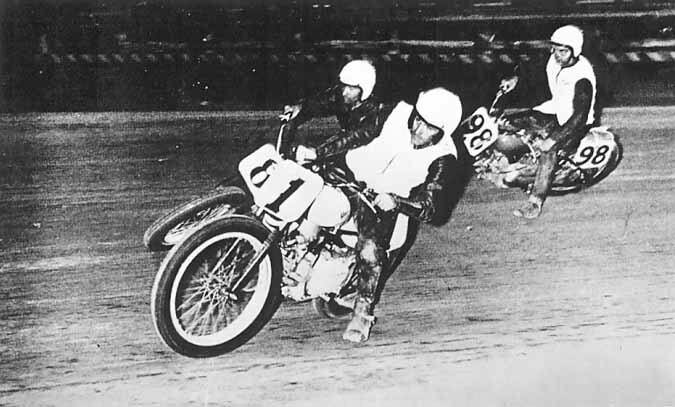 Gene Romero rode a Sprint as a Novice. 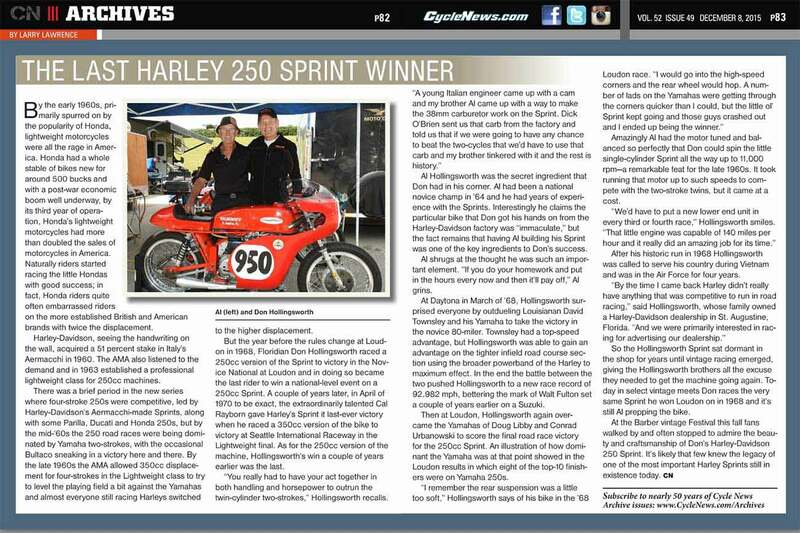 won the 1963 Daytona 100 on a CRTT Sprint. 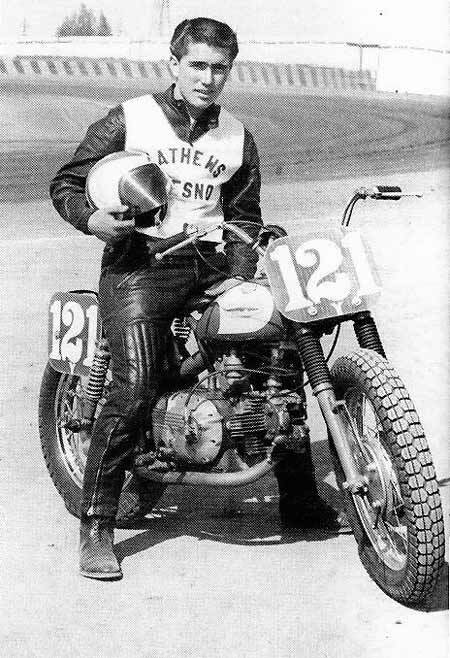 Dave Atherton at Troy, Ohio - 1967. 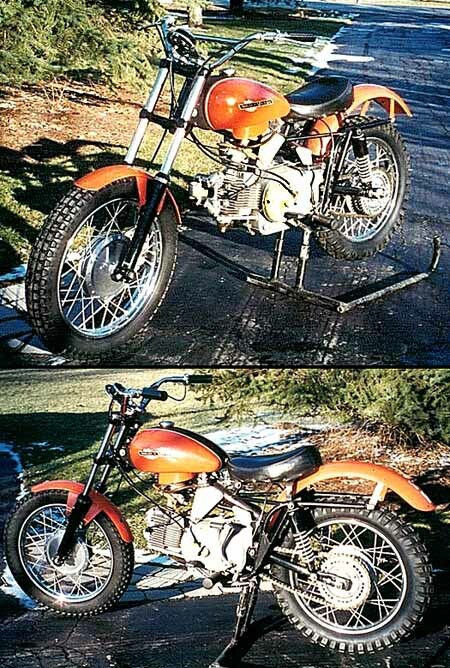 This is a barely used 1970 Harley Davidson 350 c.c. Sprint ERS. 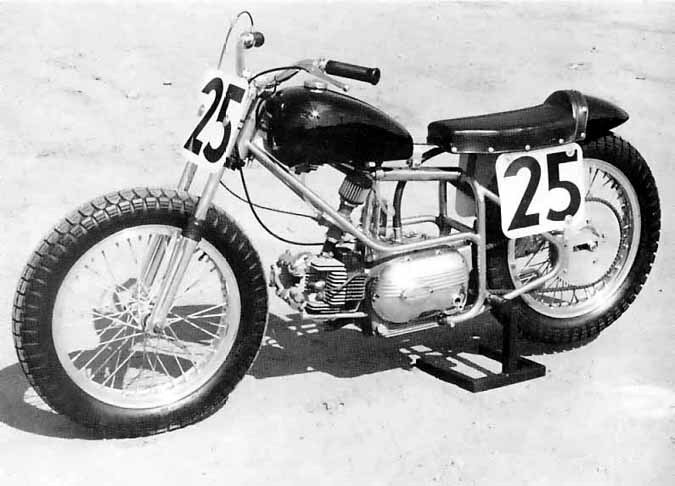 This is one of 102 ERS models built in 1970. They were built for racing for four years from 1968-72 for a total production of 572 units. I have and ERS that is all original, even including the tires. Hardly ever used. Was traded in for a new sportster several years ago. Been in my garage/shop since. 1968 - 120, 1969 - 250, 1970 - 102, 1971 - 50, 1972 – 50. 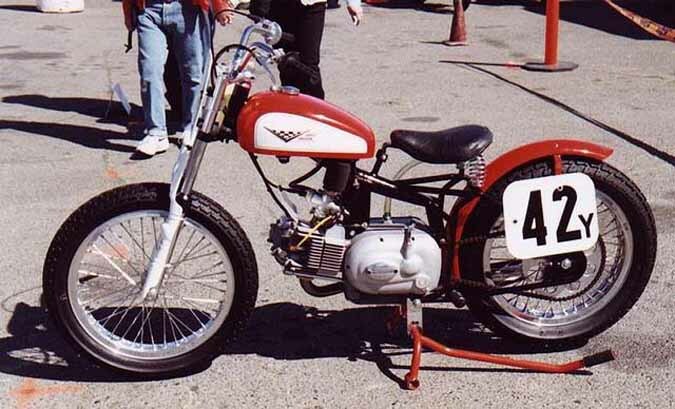 Based on the chassis number, this bike is one of the original 1968 models. It is all original and has never been modified or restored. 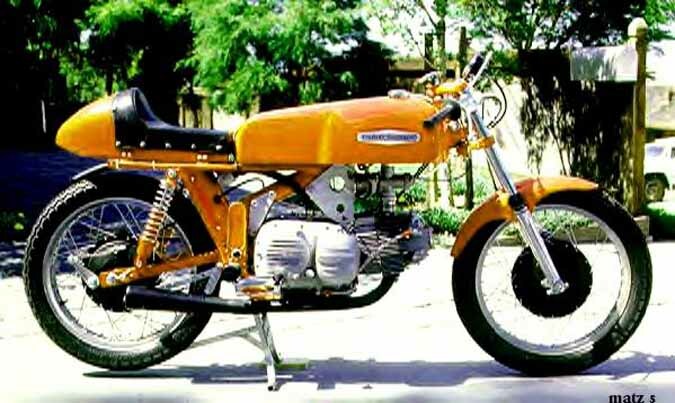 It has an Ala d'Oro 350cc engine with Bendix magneto and a four-speed close ratio box. Saw your web site and thought I would send a couple of photos of my '69 ERS. It's all original with no restoration with the exception of the recovered seat. 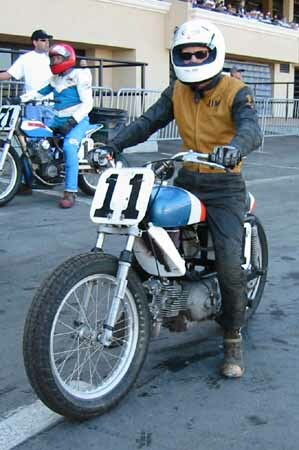 I raced it once in a vintage flat track event in Ventura, Ca. some years ago. 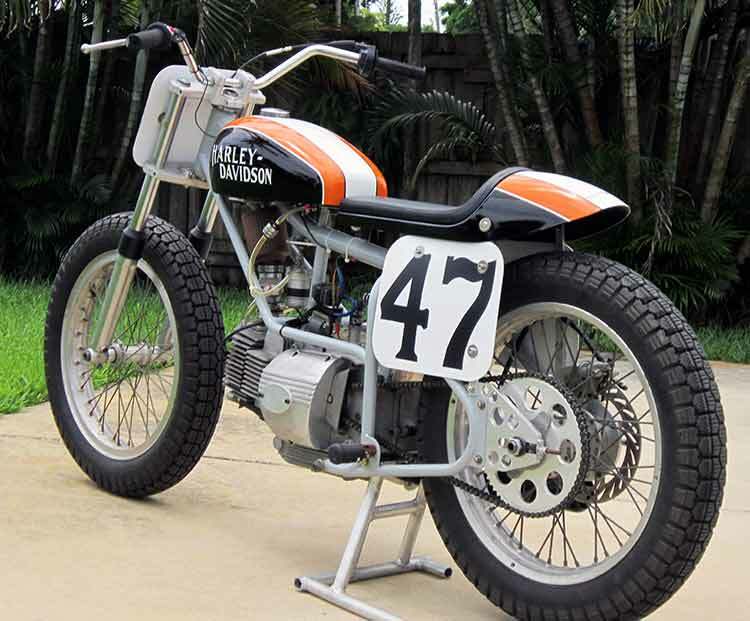 If the Grand Prix road-racing record books came with footnotes, you’d see a reference to this Italian-built motorcycle next to the only GP titles ever credited to Harley-Davidson. Yes, you read that right. 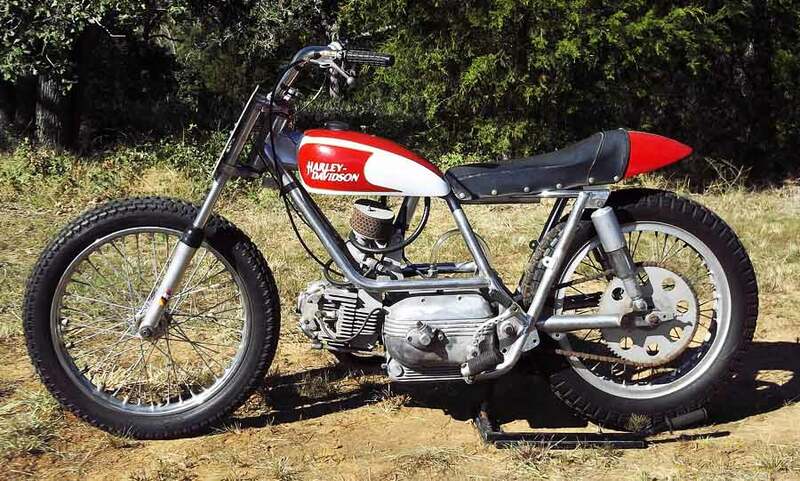 Back in the 1970s, Harley-Davidson actually was a force in international road racing, winning the 250cc class three years in a row and topping the 350cc class once. 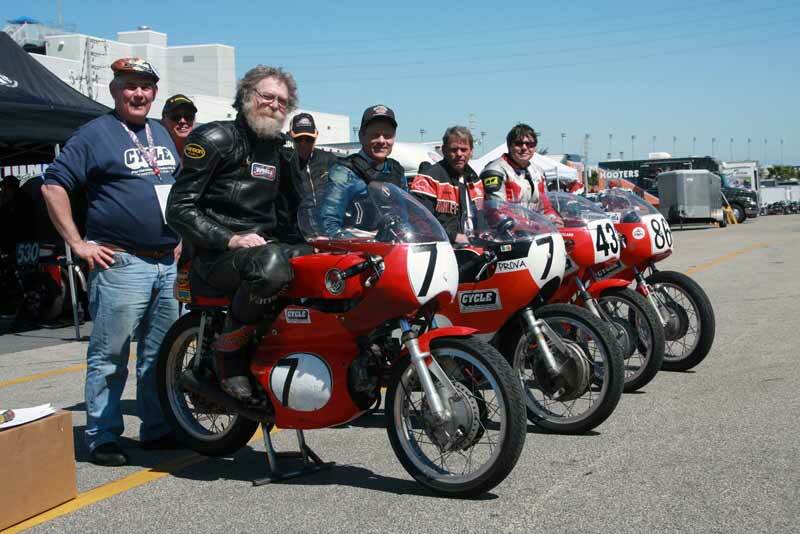 How did a company known for big, slow-revving, four-stroke V-twins rack up such an impressive streak in a form of competition dominated by small, hard-running two-strokes? 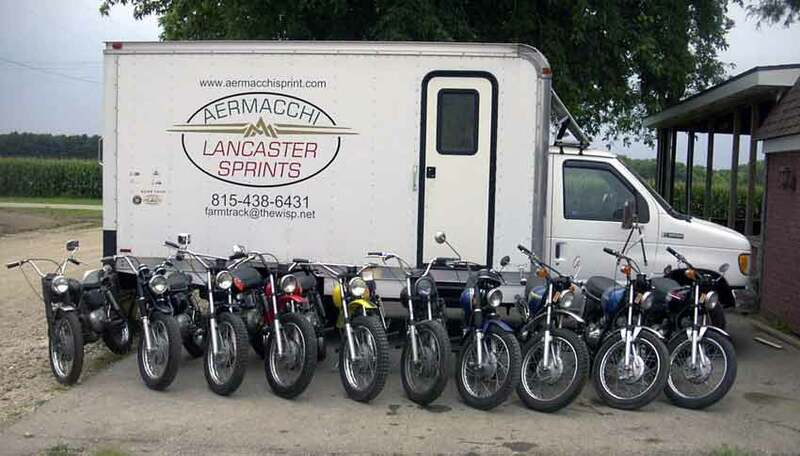 When small, technically sophisticated machines from Japan began flowing into the United States in the 1960s, Harley responded by buying a 50 percent stake in the Italian motorcycle firm Aermacchi, spun off just a few years earlier from airplane-maker Aeronatica Macchia. 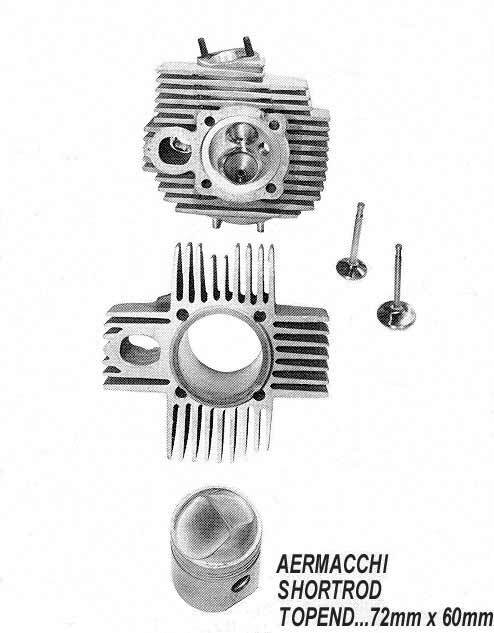 Aermacchi’s trademark 250cc four-stroke singles, with one horizontal cylinder sticking straight forward, formed the basis of the Harley Sprint line of 250s and 350s. 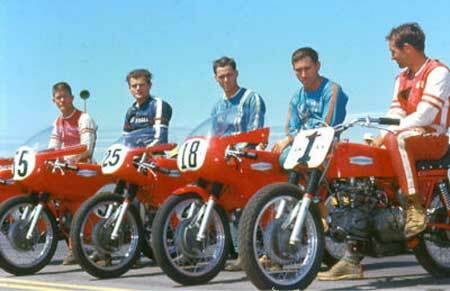 Aermacchi officials, who in the Italian tradition believed that race performance was integral to success, continued to contest the Grands Prix using two-strokes under their own company name. 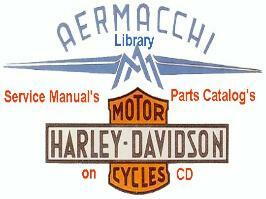 Then, in 1973, the same machines were rebadged as Harley-Davidsons. 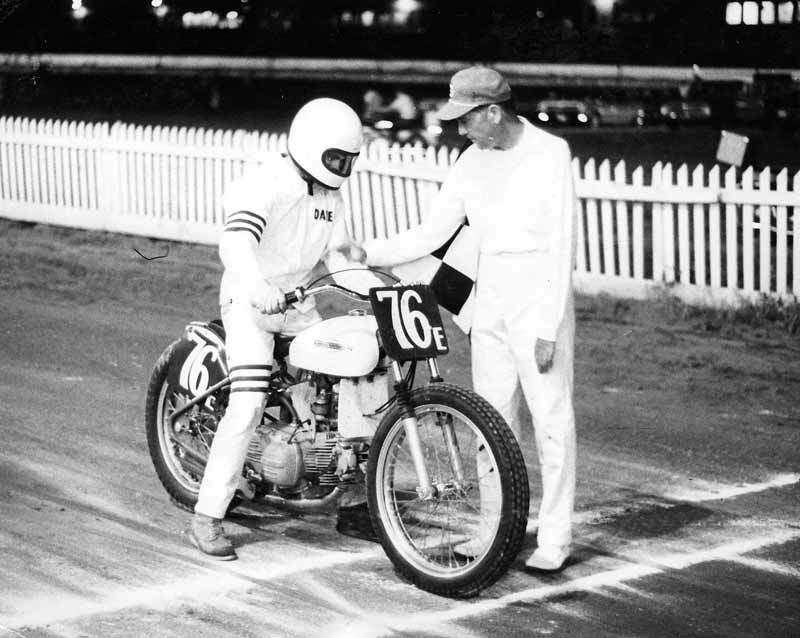 A year later, factory rider Walter Villa began a string of three 250cc championships. 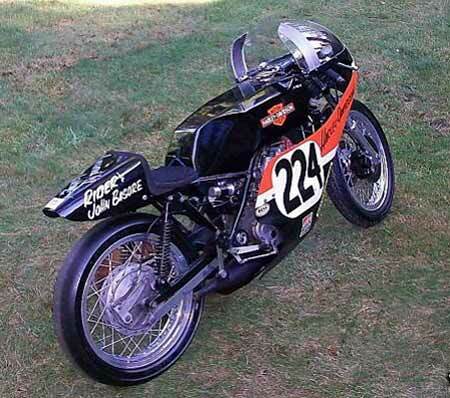 In that final championship year, 1976, Villa also topped the 350cc class on a bored-out version of the same bike. 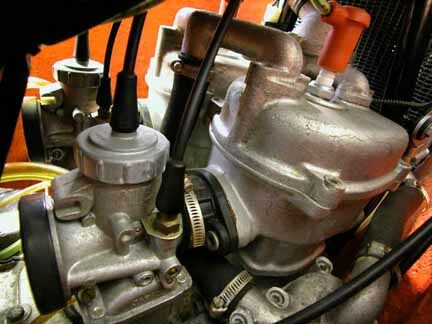 Early air-cooled versions made about 50 horsepower at 10,000 rpm. 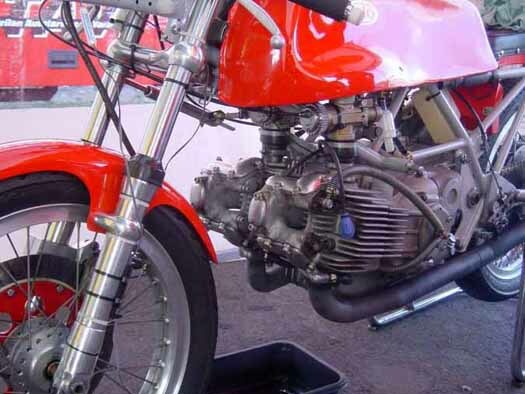 Later water-cooled bikes like this one pumped out 58 horsepower at 12,000 rpm. It’s hard to say that all this grand-prix success had any positive impact on the parent company, which was staggering through its years of ownership by the AMF conglomerate. Still, the GP race program continued through 1978. A few years later, the Aermacchi plant in northern Italy was sold to the new Cagiva brand, which continues to build motorcycles there today. 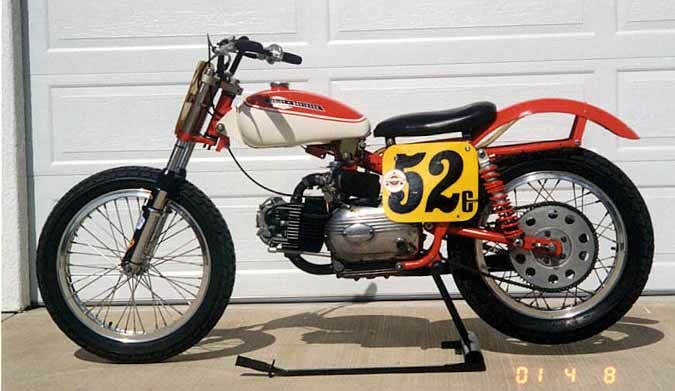 As a race machine, the RR250 was built in extremely limited numbers, which makes any surviving examples, like this 1975 model, owned by Benjy Steele of Huntington, West Virginia, pretty hard to find. 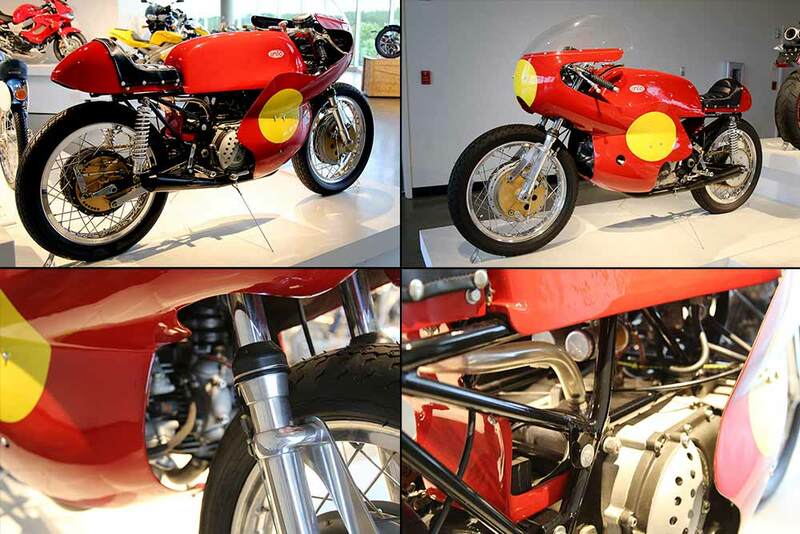 But this particular RR250, now on display in the Motorcycle Hall of Fame Museum at AMA headquarters in Pickerington, Ohio, is even rarer: It’s never been started since it left the factory. hired at Moto Guzzi. 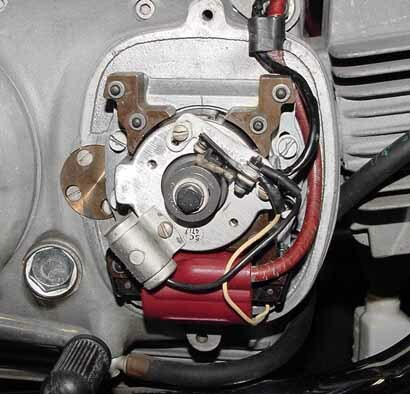 The engine in the Linto was essentially two Aermacchi top ends grafted onto a single crankcase. 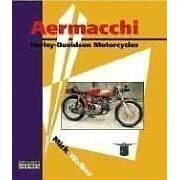 and raced Aermacchis in the Junior class during the Seventies. Text below was copied from motocorse.com site and translated by google. 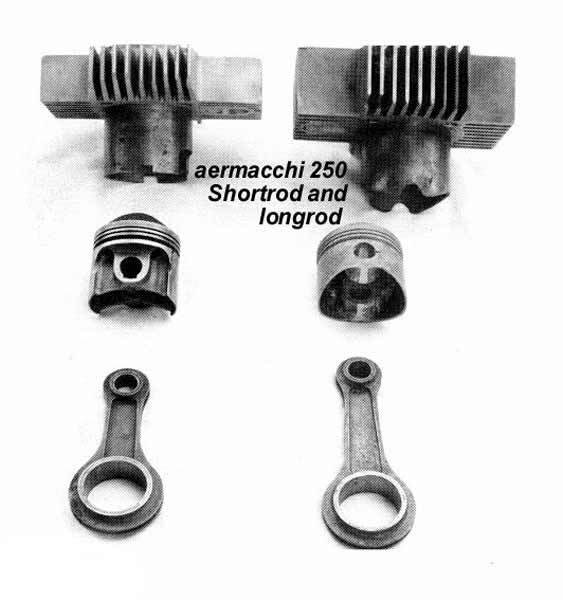 The idea to construct a bicylindrical motion of 500cc based on the Aermacchi motor - a succeeding monociclindrico of 250cc of large - is frullata for a sure period in the head of the Italian planners, and also Aermacchi had thought about being able some to construct a plan was to the end financed from the president of the Varies Motorcycle Club, a Citroen retailer of Umberto name Prewharves that had been a pilot of same motion he. For the plan it was called Tonti Linen, former Ducati planner, and the name given to the motion (motorcycle) - Linto - nacque from its name. 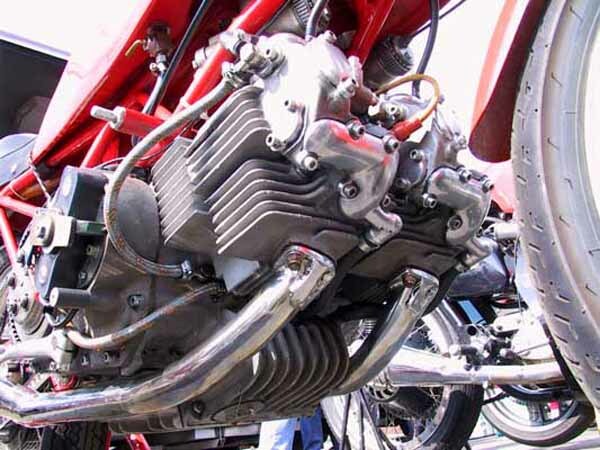 A motor was a bicylindrical horizontal with cranks to 360° that used two modified Aermacchi cylinders, therefore like the heads, the pistons, the valves and others members. The base was constructed former novo, and the motor was equipped of change to six marce. 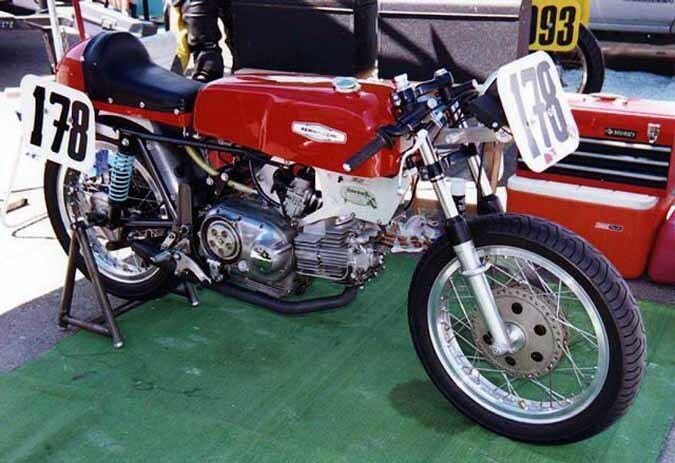 The produced maximum power was approximately 65HP to 12.000 turns/tiny, and the componentistica mounted on the chassis in steel tubes was of prim'ordine: Ceriani staple and brakes Fontana to drum. It was sure the beautifulst motion never produced, with the motion destined to the private ones painted in splendid a red fire, while those destined officials were blue. 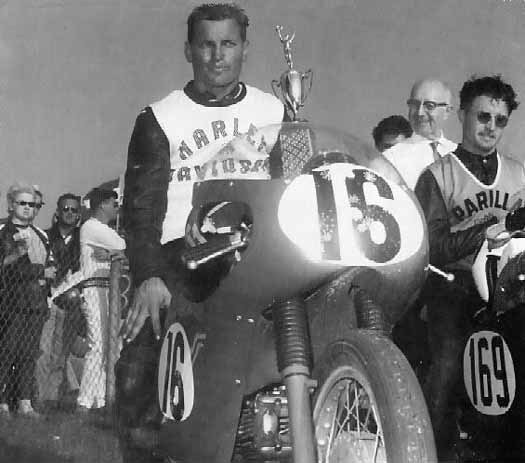 The first motion in phase of development was capacity in contest in the 1968 from Alberto Pagani, Champion of great coming from level from the Aermacchi that lived in the beautifulst city of Varese. Alberto finished to according to place in the GP of the East Germany and to the quarter the place in the GP of Italy run to Monza, where the Linto could take advantage of its high maximum speed at best. Alberto that year gained also the Piestany International in Czechoslovakia. Next to the end of the 1968 Prewharves small series of the motion constructed on ordinazione at the price of 2.300 dollars, highest thought to put in production one for the age. They came initially ordered eight motion from part of private teams, and two to superread Linto official came constructed for Alberto Pagani and the Australian ace Jack Findlay. The motion that competed in 1969 but showed one great mechanical embrittlement. One of the greater ones was the breach of the primary transmission, and in spite of the several modifications and the various materials it employs the problem to you was not resolved because had to a planning error. 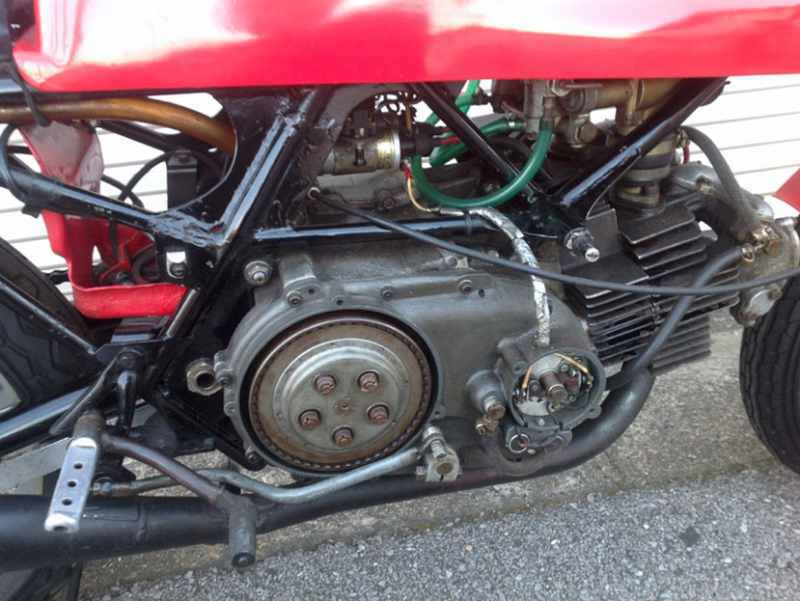 An other indeed serious problem was constituted from the vibrations, that they succeeded to quite damage the papers motor and the weldings of the chassis, and that year the planner Tonti Linen passed to the Guzzi Motion, leaving Prewharves and its staff to try to resolve the problems of the motion. The motion in any case was fastest, but equally difficult to guide: usual Linto pilot always ended on the podio, but the others difficultly arrived to the end of the contest… The motion official suffered from these problems analogous to those destined ones to tries to you, in spite of that Alberto (Pagani, ndt) gained in Italy giving to the Linto its only Victoria in a Grand Prix, while Jack Findlay conquered a third party place in the GP of the Germany the West. 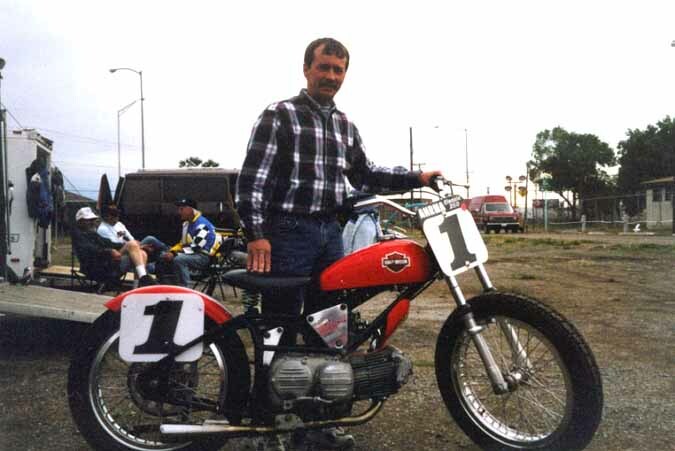 That year Gyula Marsovszky the Championship of the World, and Steve concluded Ellis finished with a diamond second place to the sixth place. “Hard” the New Zealander Keith Turner won to the Mans and the Mettet Internationals, where its motion cronometrata to 160mph (nearly 290 km/h!) on the rectilinear Mulsane, 20mph faster of the Norton and Matchless. To half of 1970 the plan to Varese was closed, and the teams and try to you will sell the motion. In the 500 the Japanese to two times had arrived, and the four times were left behind, beautifulst beasts that rest in Hush… R.I.P. In the Linto's first Grand Prix season, the bike proved fast but fragile due to the engine's extreme vibration cracking frames, and the fragility of the six-speed gearbox. 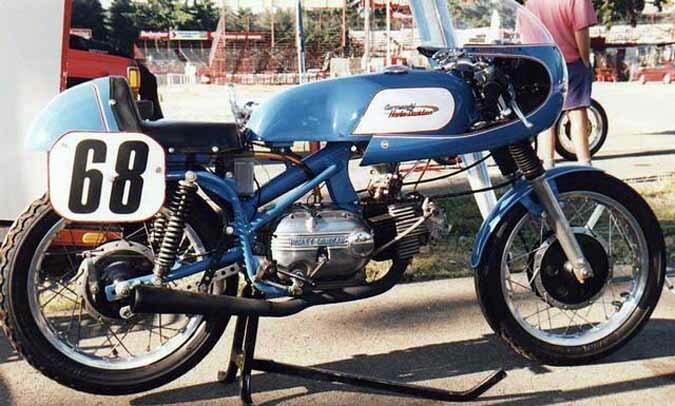 From five starts in the hands of Alberto Pagani, the bike failed to finish three times, but scored a fourth place at the Nations Grand Prix in Italy and a second place at the East German Grand Prix behind Agostini, giving it equal fourth place in the title amongst a bevy of single-cylinder Manx Nortons and Matchless G50s. 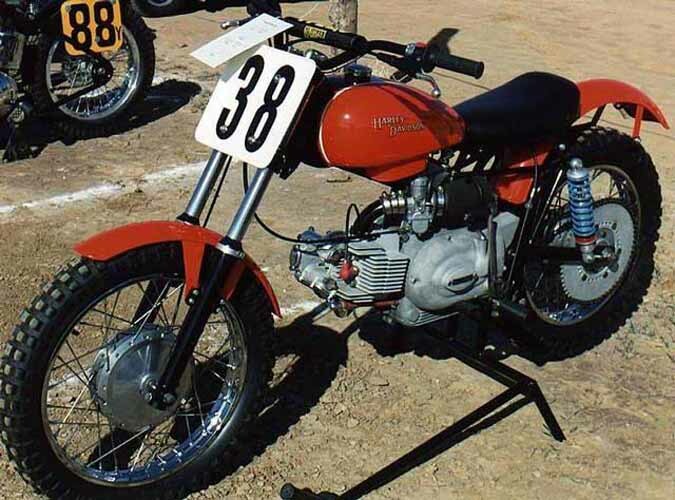 Though the company only managed to produce 16 Lintos, they became quite sought-after as privateer machines, as they were probably the second-fastest 500 class machines in the world in the late sixties, behind the lone MV Agusta four-cylinder ridden by Giacomo Agostini. 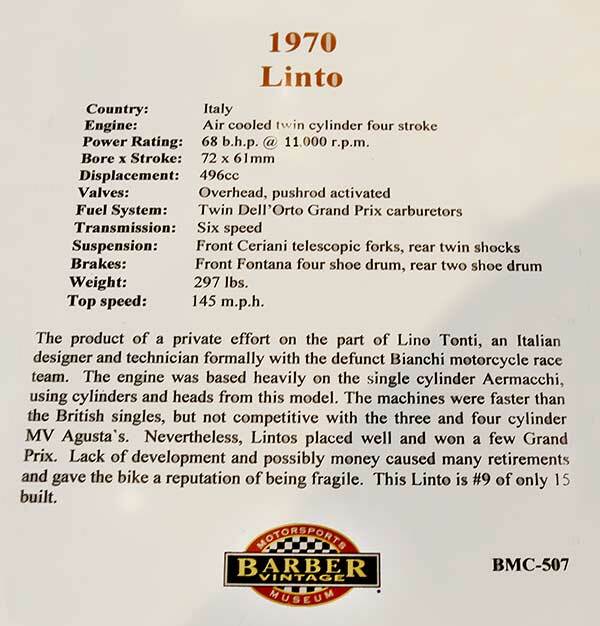 One of the last purpose-built four-stroke Grand Prix race machines in the period before expansion chambers took on a deeper note and dominated the 500 class as they had already done with the smaller capacity Grand Prix bikes, the Linto is named after its designer Lino Tonti. 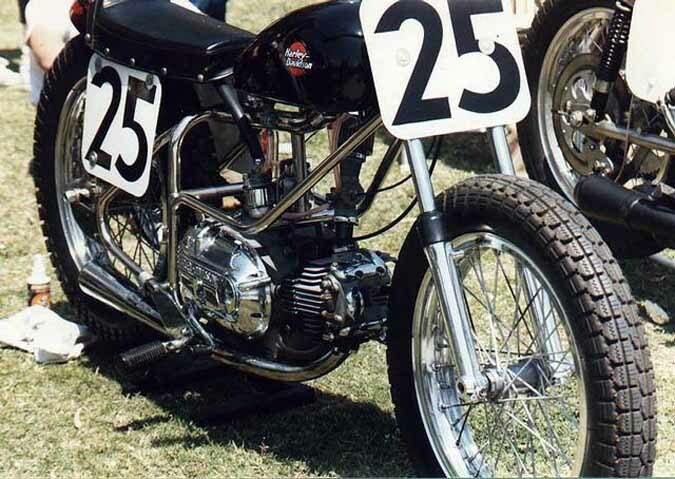 The trellis frame of the Linto was built by the specialist Milanese frame builder Stelio Belletti, with Ceriani suspension and Fontana drum brakes, resulting in a sweet-handling lightweight 142 kg bike with enough power (65 hp @ 12,000 rpm) to blow away the big singles it was competing against in a straight line. 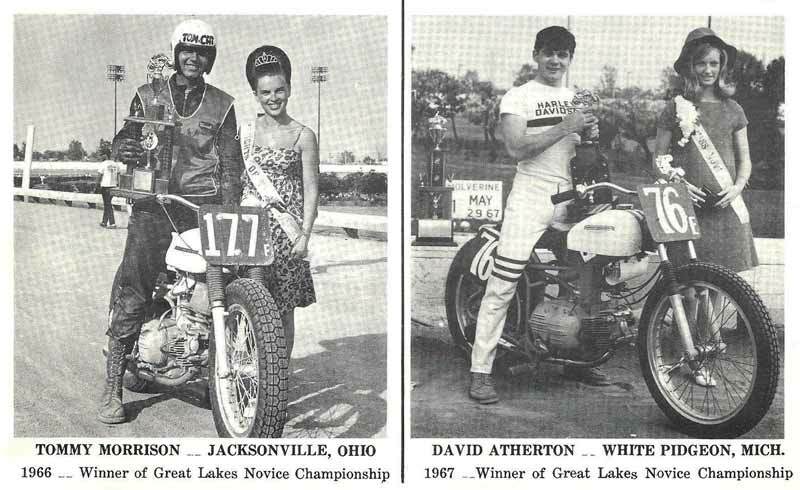 Reports suggest the Linto's near 260 km/h top speed had a 35 km/h advantage over its Norton and Matchless competitors. 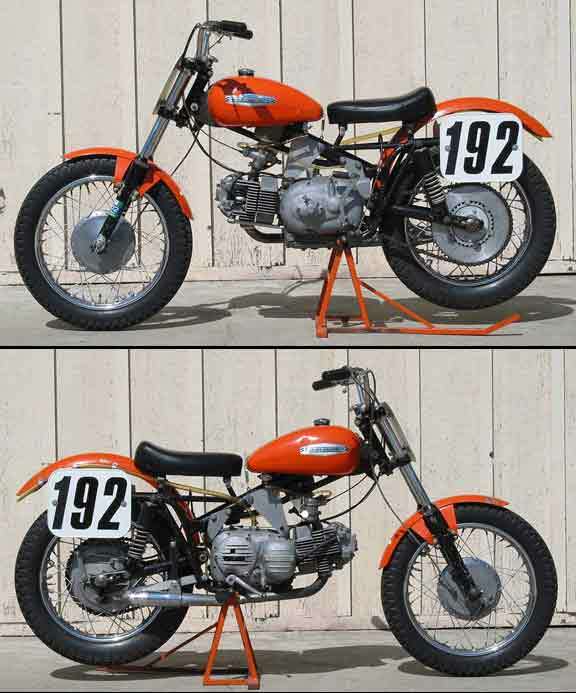 The success of the Aermacchi 250 and 350 racers prompted the Italian motorcycle designer Lino Tonti, best known for the design of the Moto Guzzi V7 Sport and his work at Bianchi, to examine the possibility of a 500cc machine based on the singles. 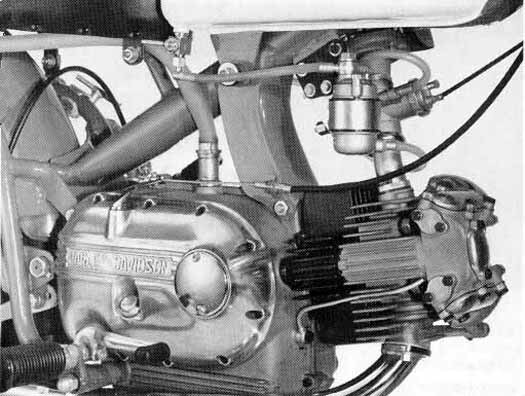 Unlike the factory's own attempts, which concentrated on building larger capacity versions of the 350cc single for the premier class ranging from 382cc to 402cc, Tonti opted for a twin cylinder machine using a pair of 1968 type Aermacchi 248.3cc cylinders and heads on a specially designed crankcase housing a specially made four bearing crankshaft. 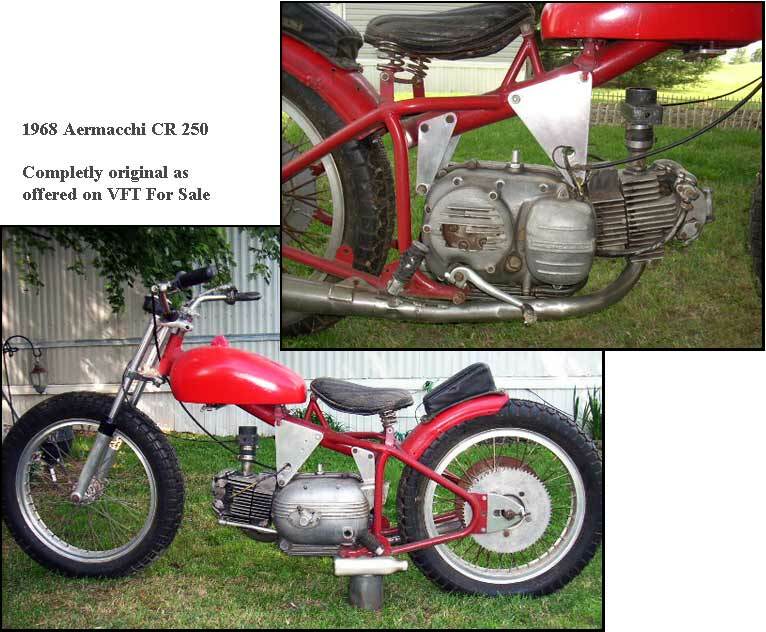 The 250cc Aermacchi single also provided the valve gear, camshafts, pistons and conrods. Drive was taken off the centre of the crankshaft via a geared primary drive to a six speed gearbox and dry clutch. Two prototypes were built, making their debut at Rimini in April 1968 with Giuseppe Mandolini and Pagani. 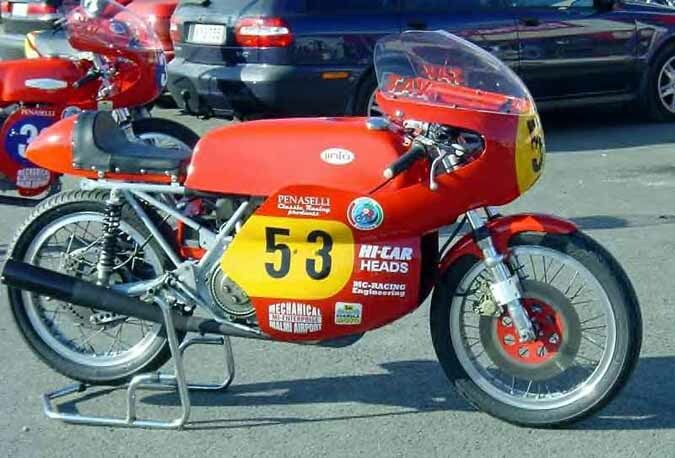 Although neither finished their light weight, equal to that of a Matchless G50 single and pace, the prototypes reputedly producing 61 bhp, promised a great deal prompting further development aided by the financial backing of Umberto Premoli. 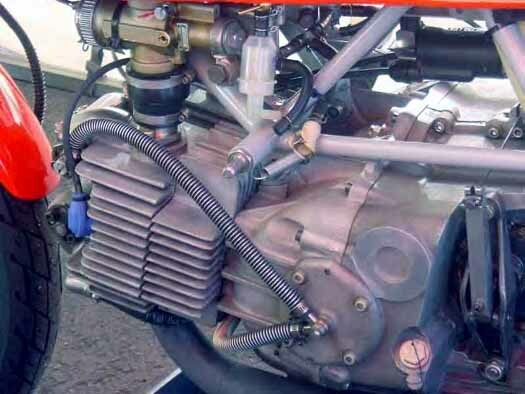 By the beginning of the 1969 the Linto was sufficiently developed to prompt the production of 15 machines for sale to leading privateers with two being retained for Pagani and Jack Findlay as "works" bikes. 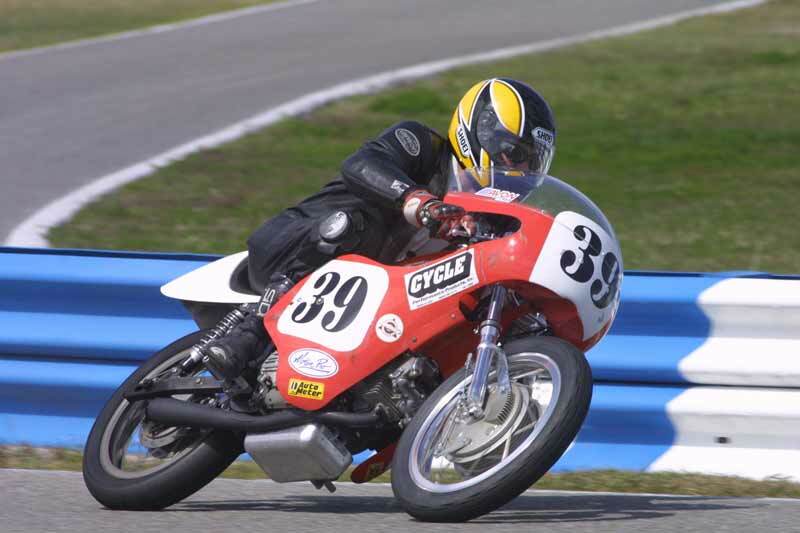 The cycle parts had benefitted from the previous season's development with Ceriani suspension being employed front and rear on the 1969 bikes together with twin leading shoe Fontana drum brakes fore and aft. The engine was, by 1969, delivering a claimed 64 bhp breathing through two 35mm carburettors, however, despite the successes of the first season, which had seen Pagani secure second at the East German Grand Prix followed by a win at the 1969 Italian Grand Prix at Imola, the Linto failed to make a significant impression with Pagani eventually switching to an MV Agusta in 1971 after a frustrating 1970 season. The example offered is number 10 and was returned to Italy 28 years ago by the Italian collector Gianni Perrone after he discovered it in Argentina. 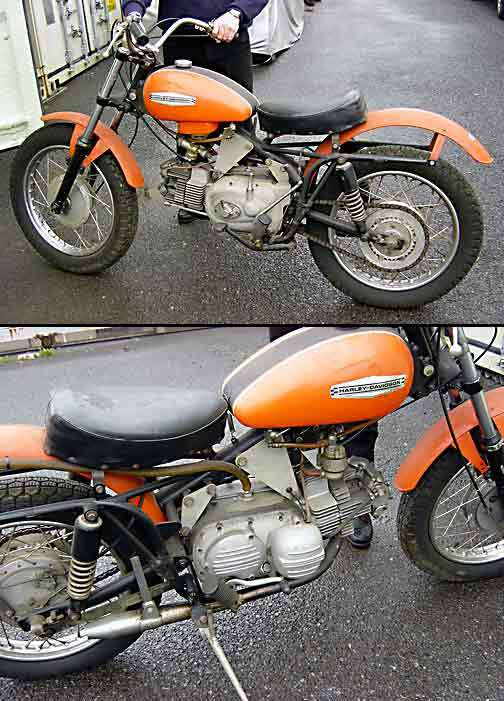 It is presented in original, unrestored condition, apart from the outside of the original fairing being painted and new decals being applied to the fuel tank., although the engine was reportedly running when it entered the museum in Japan where it has subsequently been displayed. It offers a unique opportunity to acquire such a highly collectable and rare piece of racing machinery from one of the golden eras of Grand Prix racing. Euro links come and go. 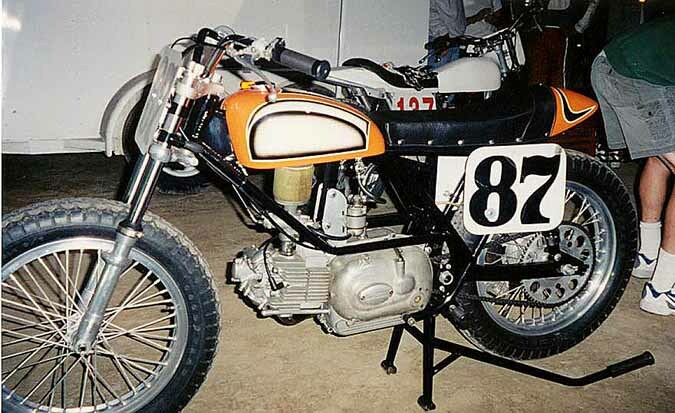 Did Anyone ever see a Linto engine in a Flat Tracker? 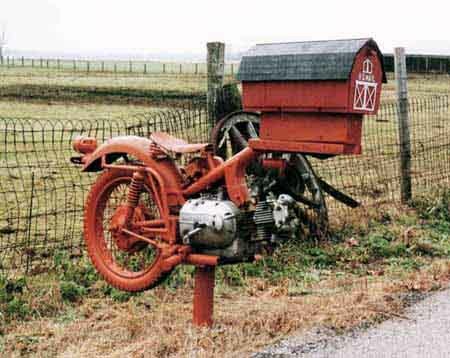 The best use of a H-D Sprint? 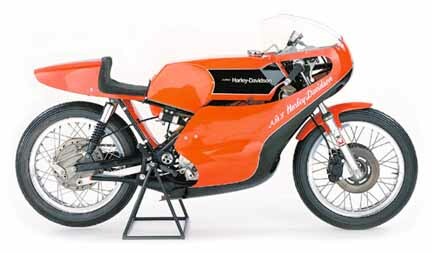 This is the real deal: a genuine, Made in Italy Aermacchi Harley-Davidson Sprint CRS racer! 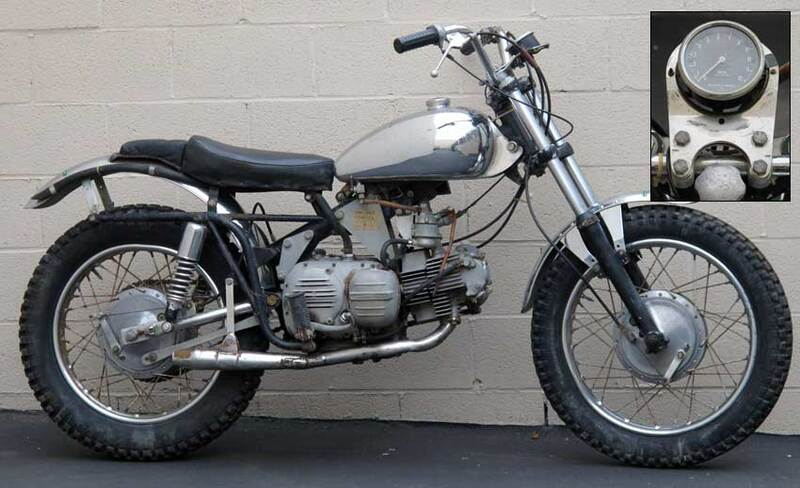 This 250cc model was offered for just two years, 1967-'68, and was meant for off-road Scrambles and TT racing. It is not now, nor ever was street-legal, and does not have lights, a horn, or even a kickstand! No license plate or title, either; just a bill of sale. 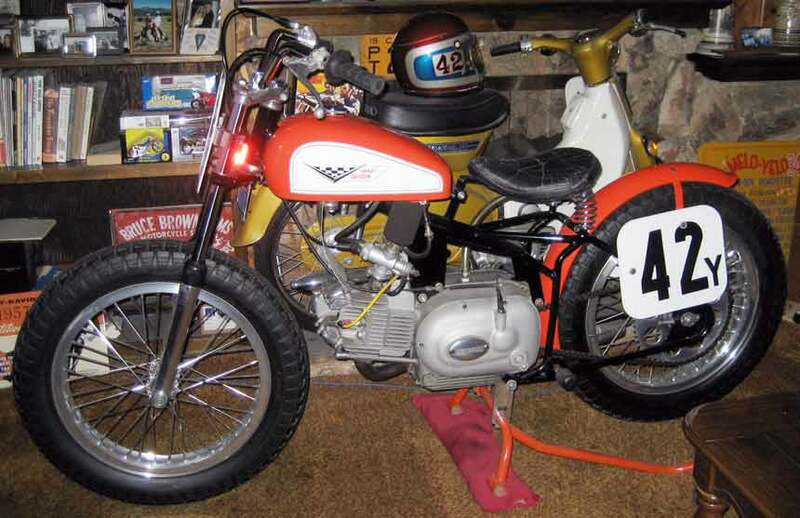 The current owner is an 86-year-old veteran who purchased the bike from a friend in '72 and last rode it in '94; it has since been stored in his garage. It's crusty and rusty, but all there, with matching frame and engine numbers. 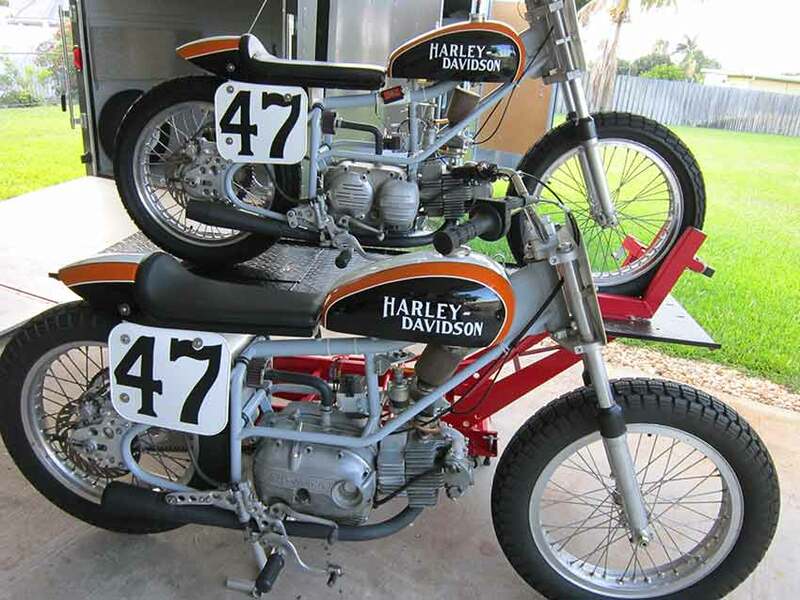 A sticker atop the chrome gas tank touts it as "The only H-D to finish the 1969 Jackass Enduro," while another on the gas cap christens it "Ol' Growler." 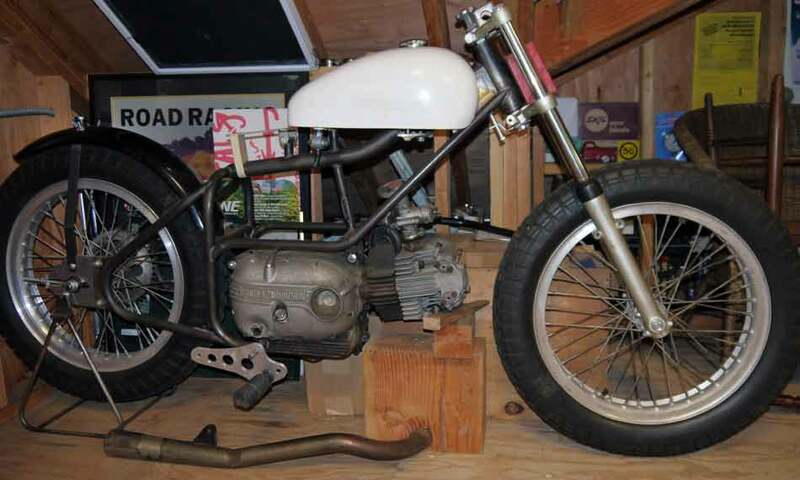 This four-stroke horizontal-single bridges the gap between the heavy British vertical-twins of the 1950s-'60s and the lightweight Japanese two-strokes that came to dominate in the early '70s. 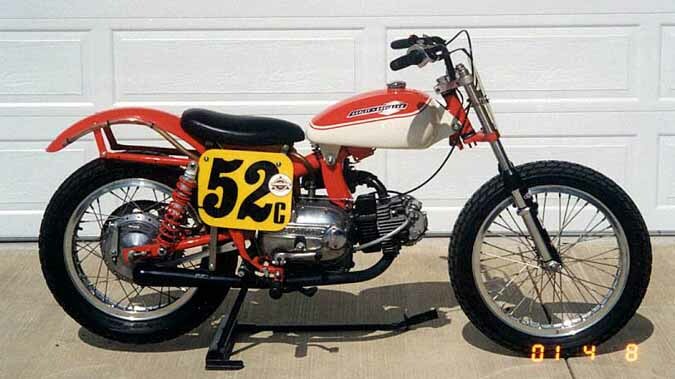 Asking $4500 for this rolling piece of moto-history. 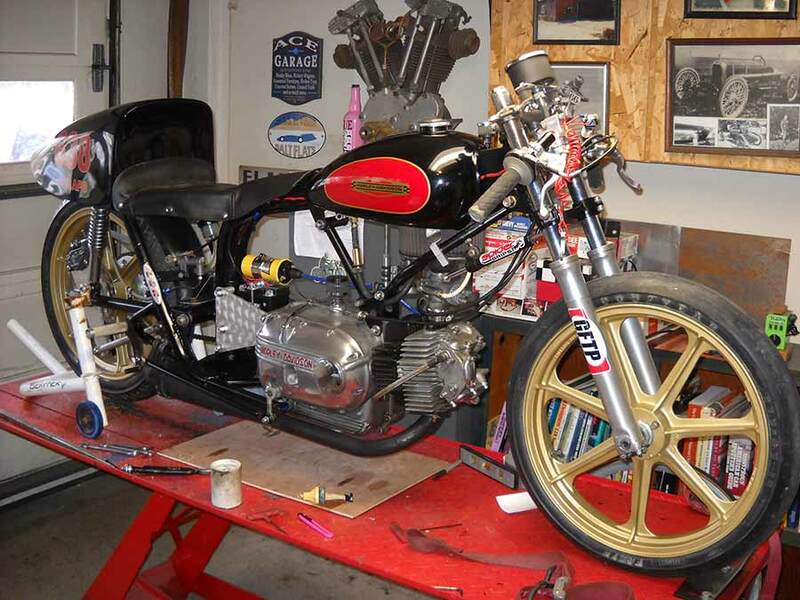 Harley Sprint, Sonic-weld frame, 65 'CR' motor with 65H cases, Harley wheels, Ceriani forks and fiberglass tank. 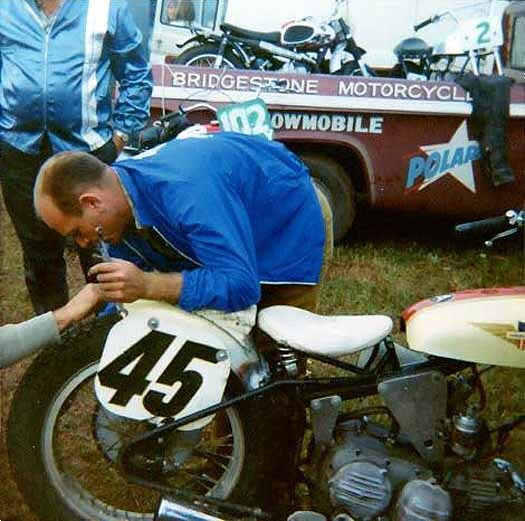 Also have box of parts: new crank pin and rollers, piston, valves and springs, gaskets, magneto, etc etc..
Hi Dennis, Finally got around to looking at the "Sprints" section and thought you might like to post this one. It's the Kerber/Doerfler "Oregon Sprint" that ran at El Mirage dry lake in 2012 and did not set a record. (ran 99 on a 100 mph record) but you have to admit, it was pretty. 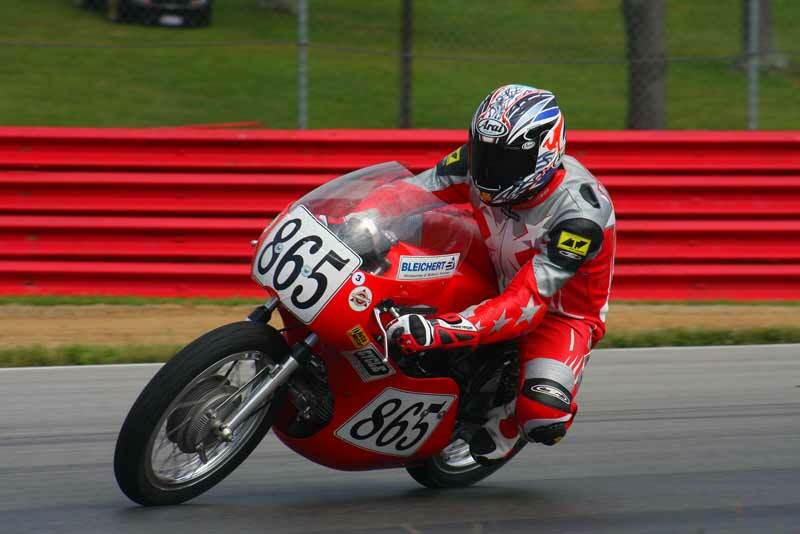 Chris Kerber/Doerflers (also the owner and long time racer of the number 68 road racer in "Sprints") 250 CRTT engine. My chassis which has also held my 500 Triumph and holds Bonneville record in 500 pushrod gas. Thanks, Martinnewegg.